Report: Global Warming Could Melt At Least A Third Of Himalayan Glaciers : Goats and Soda If temperatures continue to rise, glaciers would begin to disappear, with a serious impact on the area's water resources. The Ngozumpa Glacier in the Himalayas of Nepal, filling the valley in the foreground, now contains meltwater pools. 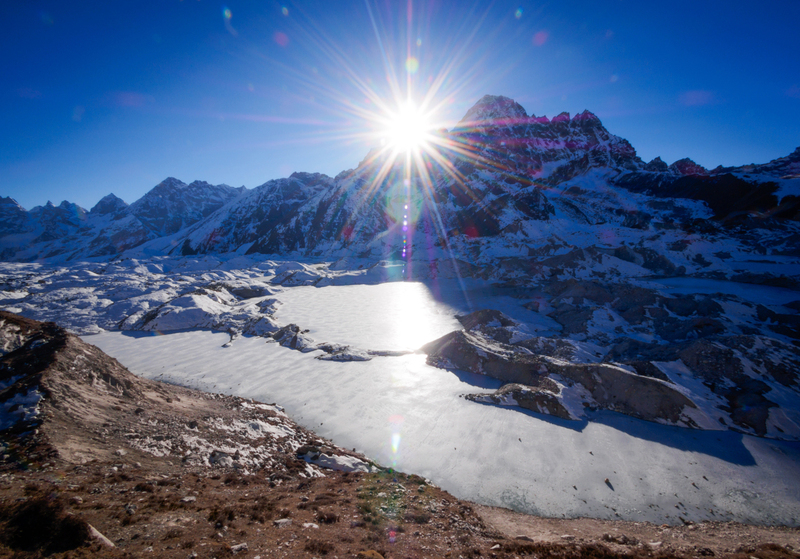 The forecast is dire for the glaciers of the Himalayas. According to a report released Monday, a third or more of them could be gone by 2100 — melted because of earth's warming climate. And that could have disastrous effects on the water resources of some 240 million people. Representing five years of work by more than 350 researchers and policy makers from 22 different countries, the Hindu Kush Himalayan Assessment analyzes studies from across the region. The International Centre for Integrated Mountain Development (ICIMOD), a Nepal-based intergovernmental organization, pulled together the 210 scientists who authored the report in the hopes that better coordination between scientists and national governments can make the evidence more clear and lead to solutions. The Hindu Kush Himalayan (HKH) region spans eight countries from Afghanistan to Myanmar and includes some of the world's tallest mountains, including Everest and K2. The glaciers sit atop these mountains, and the water that runs down from them feeds the agriculture that nearly two billion people depend upon. Called the "third pole," the HKH, together with China's Tien Shan mountains, holds the most ice outside the North and South Pole. But so far, the report claims, less attention has been devoted to the region than to other areas vulnerable to global warming. The toll on the glaciers depends on the degree of global warming. Even if the atmosphere heats up only 2.7 degrees Fahrenheit (a scenario that scientists say is ambitious and unlikely), the report predicts that a third of the region's glaciers are likely to disappear by the end of the century. But the damage could be much worse. If the current rate of emissions continues, warn the authors, temperatures could rise enough to wipe out two-thirds or more of the HKH glaciers. And that's likely in the HKH. Temperatures are rising faster in the mountains than at lower elevations, a phenomenon called "elevation-dependent warming." Researchers are still trying to figure out exactly why this happens, says Arun Shrestha, a lead author of the report's climate section and a senior climate change specialist at ICIMOD. One theory: When snow and ice melt, the heat- reflecting properties of the white cover disappear. The black rock below absorbs more heat and increases the melt. This means that even if global warming is limited to 2.7 degrees Fahrenheit, the HKH region will see a greater increase. The melting of glaciers would bring a series of significant changes to the region, says Philippus Wester, one of the editors of the report. Rivers would have more flow initially, creating the potential for flooding. But eventually the flows from the melting glaciers would decrease. The overall impact of climate change is also causing sources of water for agriculture in Nepal, like springs, to dry up. Glacial melting will also likely cause global sea levels to rise, threaten already endangered species like the snow leopard and tiger and dramatically change the roof of the world. "We'll no longer have these snow-capped mountains," says Wester of the iconic Himalayan range topped off by glacial snow and ice. The people living in the high mountains are already seeing the changes. Sherab Lama is a Buddhist monk who grew up in a village that juts up around 16,000 feet in Nepal's Dolpa region. From Lama's village, a triplet of mountains are visible. Lama says the mountains are called Ghangri Poosum in Tibetan, which translates loosely to "three ice-covered brothers." During his father's childhood, the three brothers lived up to their name, but when Lama was a boy, only two were ice-covered. Now, the 40-year-old says, just one has ice left. Lama says the villagers are working on environmental initiatives, like limiting plastic waste. But they know what's happening to the mountains is beyond their control: "[Those] who know about climate change, they are scared. They say, 'I don't know what will happen after two to three generations.' They are very worried. I am very worried," he says. The report notes that climate change is adding to the burdens many women in the region already face. According to Chanda Gurung Goodrich, a lead author on the gender section of the report, men in mountain regions are increasingly migrating for work as climate change makes it harder to make a living in agriculture. The report says that the women left behind are the ones who will have to cushion their families from the results of climate change even as they lack the authority and access to resources given to men in this culture. The best case forecast isn't reassuring. "Even if we are now able to level the CO2 emissions and the temperature increase, the glaciers will continue to lose mass during the next decades," says Tobias Bolch, a lead author of the report's cryosphere section. But Bolch isn't holding his breath that global warming will get under control. "There will always be deniers and science will not be able to provide the absolute truth," says Bolch, "but what we can provide is huge evidence." The report's authors plan to release future assessments to monitor the changes in the Himalayas.